Who’s saying that? Of course: it’s the conductor. But wait! Our students are thinking the same thing! There are, in fact, at least four powerful reasons for us to watch them! When they look up, they must see us looking up - or they won’t try any more. Will our students watch and follow if this is what they see when they look up? Maestro may be busy “conducting,” but s/he’s not going to ignite much response. “Every time we look up and find your eyes glued in your own score, it trains us not to look up. There's not going to be any connection and, consequently, no helpful musical direction." When our young musicians look up, they must see doing the same. We must be worth watching - worth their taking the risk of making a mistake...or getting lost. If they overcome these fears...so should we! ​They must see gestures that look like we want the music to sound like, delivered with strong intent, and, of course, with our watching them. We build rapport and trust through the powerful non-verbal messages we send...especially our smiles of approval and apprecitation. We can send silent messages if a student or section was late, out of tune, or not in synch with others. Looking at them for entrances or helping them with tricky rhythms lets them know know you understand and you’re there to support them. Their engagement, rapport - and, yes, even gratitude - increases. From this comes better music making, a happier ensemble, and a much happier conductor. Their confidence in you increases. They see you know the music. Your attention builds their self-esteem. They’ll have better attention, posture, and focus. Watching your ensmble will help you identify and fix problems whose source your couldn't identify when you were reading the score. Watching helpes us hear problems we didn't hear when we weren't. As my friend, Charlie Wilson, says, "The ear hears what the eye sees." But if we’re watching, we see they’re getting their instruments up late, and breathing late - that’s the cause. You can then tell them to mark their music to bring their instruments up four bars earlier, and take their breaths two measure before the entrance. The struggle for engagement will decrease, often dramatically, as you connect more deeply and personally with your students, and feel their increased trust, cooperation, and appreciation. You'll have more of the transcendent experience of being follow since they will be watching you. You will experience the blessed freedom of, from time to time, conducting without looking at the score; this is major! Your confidence in your conducting will grow as you learn you know the music much better than you thought. When you Look, you see a Lot! What does our Maestra see when she looks up? With her head in the score, she heard - but couldn’t understand - why they weren’t following her. But now she knows: she didn’t look at them, so they didn’t look at her, and couldn't follow. Perhaps more than any other chapter, Us Watching Them opens the door to igniting engagement, rapport, and inspiring music-making. We know all this happens when they watch us – as long as we’re watching them. Few of us were taught THIS during the one or two conducting courses we took in school; there was just time for beat patterns, left hand gestures, score reading and transposition, notation, seating arrangements and other basics. And if we had time to spend on Watching - it was invariably about our students watching us. That’s why this full workshop on Us Watching Them, with its extensive list of benefits: to convince you to take this topic very seriously; to study, reflect, practice (this chapter tells you what and how), and to watch them like crazy in rehearsal. Find a straight ahead passage in the music you’re rehearsing. 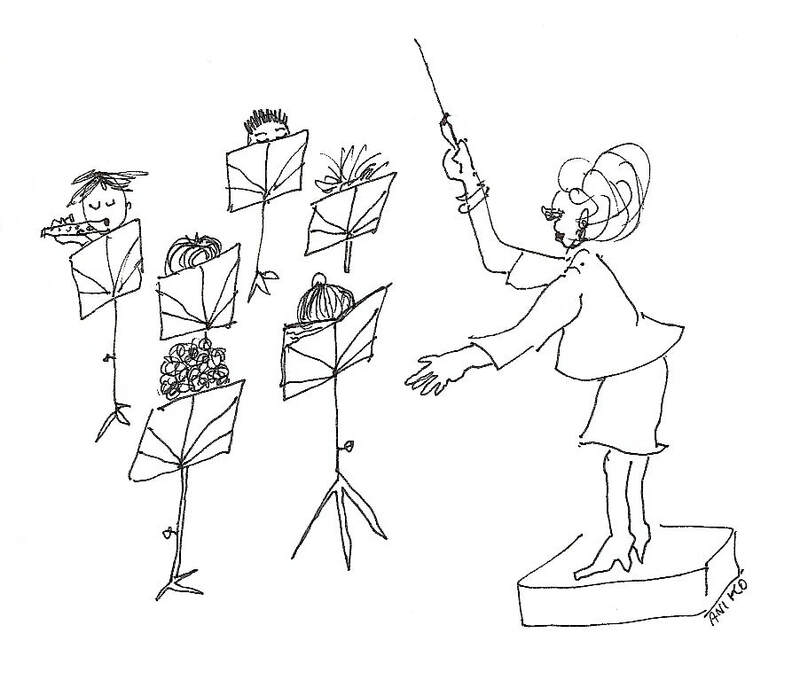 Tell your students you’re going to start them, then you’ll stop conducting, but they should keep singing/playing. Get them going, then stop conducting and simply watch what’s going on. (You’ll be astounded at how well they play on their own). Here are only a few of the problems you’ll see when you watch...that you only heard when you weren’t watching. A section leader but not giving clear preps and cues. Not using full bows, or taking shallow breaths. I won’t even say, “texting." ​If we're not watching our ensemble, we can't know these vital issues. Just imagine how many musical and personal challenges you could address on the spot if you saw them happening. And just the fact that your students knew you were watching them would solve so many issues without your saying a word! These exercises will help you watch your young musicians as naturally as you beat 4. You may want to start with ones that are easy for you, make them your own, excite your students and yourself with the results, then, one-by-one, add others. As they build on each other, rapport between you and your students increases - as will your confidence - and your ensemble sound, rhythm, and spirit will be better. This huge improvement in both rapport and music-making will juice the kids, and the benefits will keep multiplying. They’ll listen and do what you say more. And this will make you a happy, happy person and musician – all because you started watching your young musicians more! Standing up, put a book on a table. Look at it intently. Then look up across the room. Is there a difference in the size of your world when you do? That’s the difference between watching your score and watching your students. Which will help you make better music? Ask a friend to watch you, or videotape yourself rehearsing. Also ask your students if they would like you to watch them more. This will help you to determine whether you need to practice looking at individuals and groups in their eyes. If you find this difficult, start by looking at the tip of their noses. To the person you’re looking at, it seems you’re looking into their eyes. Then, little by little, raise your gaze higher on their nose; you’ll see their eyes peripherally. Slowly, you’ll become comfortable seeing their eyes, without looking straight into them. Eventually, you will become more comfortable looking in folks’ eyes. This really works! Remember this will help you make better music and have a richer musical and personal experience with your ensemble. Greet your students at the door; look them in the eye when you say hello. Practice glancing over groups; at the same time, look in their eyes. This may sound impossible, but glance from eye to eye in the same way that your eyes sweep from word to word while reading. Seeing each word, and also the larger phrase, then the whole sentence = seeing each musician, then section, then the whole ensemble. With practice you’ll be able to do this incredibly quickly. You don’t think so? Well, have you ever practiced? people in lines in stores, or families looking at puppies. 3. Then work on watching larger groups in waiting rooms, or in audiences, etc. looked at each and every one of them. is a sign of disprespect. And we must respect that. How to watch them if we don't have time to memorize the score? The good news here is that for us, score study is rehearsal preparation: see Score Study is Lesson Planning, pp __ to __ to see how easy it is. Really - why not have a quick look now - the main points are on the 1st page, so you can relax on this one. In whatever space you have, imagine your ensemble in front of you; if you can move some furniture around...or put pieces of paper on the floor to where the principals of these sections sit. Stand in the conductor’s spot and look from one chair to the other in the order of their entrance. Practice conducting these spots at home and get them into your muscle memory so you don’t have to think - it’s no different that moving your fingers, hands, arms, and vocal chords. Moreover, your students depend on you at these spots so you must be there for them. Look at the spot: who needs what? That is, what do you have to do to make the spot work (refer to etc. etc.). Figure out the gestures needed for that spot. This is getting the watching and cues out of your head and into your muscle memory. When that’s solid (give it the time it takes, maybe a day or three), say the name of the instrument as you move your gaze. 6. Train yourself to watch you ensemble when you begin, NOT the sscore. At home, practice opening a score to the first page and then begin conducting it – WITHOUT LOOKING DOWN! Why look at it? It’s always the same! You will feel your muscles wanting to pull your eyes down. NO! Resist! It’s only your muscle memory – you open the score and look down automatically. All you have to do is: Put the score on your stand, open it to the first page without looking at it, look at the wall/a mirror/out the window, start conducting it. Do it over and over, and in a few days, you won’t look down again in that piece. You’ll feel so strong and in control when you do. Take out a score and start breaking that habit – today! Because you feel the music’s emotion doesn’t mean you’re showing that emotion with your facial expressions. Make a list of expressions and dynamics; practice them in the mirror, then practice them in class. Make a list of expressions called for in your scores. Practice making those expression as you conduct through a piece. Again, muscle memory will make it so you can't NOT make those expressions. Some of us will create benefits from doing this that go far beyond your conducting, including more effective communication with friends, family, colleagues, students...anyone whom you want to impact. The increasing number of emoticons in our lives -  are persuasive proof of the importance of our facial expressions. Emoticons are appearing more and more in internet communication platforms: emails, social media, and more. Why is this true? Because facial expressions are so important in communication. 1. Look at the Students - Not Your Score - When You Start. You’re looking at your students just before you start and they’re looking at you. Don't break your connection by looking down right before you give the downbeat - something that so many of our colleagues do. Do you really need to look at the score when you start? You know who’s playing at the beginning. You know it’s in 4, or 2, 3, or whatever. You know what the piece sounds like, what the mood is, and who starts. So why look down? Purely out of habit. See the previous section for how to stop doing this. Write “Look Up” on a 3 x 5 card and tape it on your stand. Tell your students what you’re doing and why. Ask musicians in the front row to give you a signal if you start without looking at them. They will absolutely help you. You’ll have admitted you’re human (how well they know it) and your asking them to help you learn empowers them greatly. Make sure everyone is looking at you – Everyone! – before your raise your hand/baton to begin. But you won’t know this unless you’re watching them, right? If you don't, you're sending the message: "I'm going to start even though you’re not watching. Therefore, it’s ok not to watch," and it’s the exact opposite of what we want! When this is successful, smile at both. This smiling is so important; it makes one feel helpful, and the other is relieved you’re not angry. These actions – essential to rapport, trust, and the best music-making – are only possible when We’re Watching Them. It’s very tempting to watch only the watchers; they’re the ones who give you good feelings. But that’s not your job (although it makes life happier! ); you have to work on getting everyone. If you can’t get the non-watcher's’ eyes, catch the eyes of a watching neighbor, raise your eyebrows (if you can) - or nod your head at the non-watcher - some gestures that communicates, “I need your help in getting your neighbor to pay attention. To this for the watching neighbors of all non-watchers. The results will be incredible as the non-watchers now start watching - they’ve been caught! Spoken corrections are rarely effective - or even heard - when delivered with our eyes down. ​If we do that, it’s like we’re talking to the score, and hoping the score will somehow speak to our students! Many of your students will be especially hungry for your eyes since they've rarely been looked at deeply and consistently and encouragingly. Even if they may not look as if this is the case, they want to feel noticed and appreciated...even more than other students. Looking at them can transform their lives! Your looking at them truly has the power to transform - don't withold it. Ask your kids to make a “face map” of the piece you’re working on. When there's a new dynamic or expressive marking, a different student should convey that with their face. Go around the ensemble and let students make the appropriate facial expression. This is not only a riot, but the young musicians will be sure to be far more sensitive to your facial expression and, if you make good ones, will sing/play the music much more expressively. These are just a few of the ways the "Us Watching Them" perspective can make a significant - even dramatic - impact on your music making...and everyone's personal satisfaction. I've been at it for over 30 years, and this I assure you: persist with deep dedication to your students' growth as musicians and people...and their lives - and yours - will be transformed.